In a blender, puree cilantro, water, lime juice, garlic, salt and pepper until smooth. 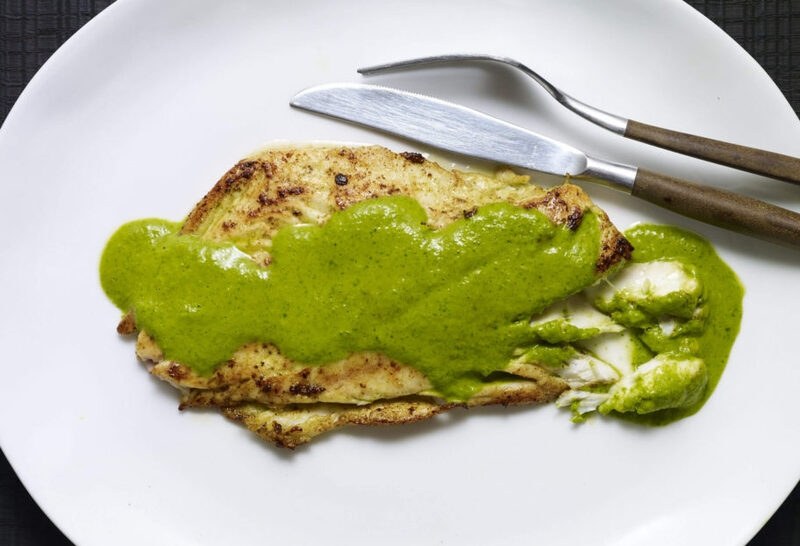 Place fish on a rimmed plate and pour marinade over, turning to coat. Let sit 5 minutes. To prepare the sauce, in a blender, puree olive oil, bitter orange juice, cilantro, parsley, chives, salt and a pinch of pepper until smooth. Pour into a small saucepan and place over medium-high heat. When sauce starts to boil, add broth and season to taste with salt and pepper. Heat oil in a skillet over medium high heat. Sear fish filets until golden and cooked through, about 2-3 minutes per side. Transfer to plates and spoon over warm green sauce to serve. Could this recipe work with Salmon or Halibut? That is the only thing available where I currently live! Sure! Both will work. Enjoy the fish, Rachel. Would Flounder work with this recipe Pati? Love you show and your recipes.. Love beans and I am always making the Charro Beans after I make a big pot of Pintos. So very yum! For sure…go for it, Marie! I missed your show when you made octopus. Would you please email your recipe to me. I looked all over on line, but could not find it. I also have the 2 cookbooks, you so generously gave me, that I will treasure forever and I’must so proud to own. My husband was nice to me and bought me a blender so I can cook like you. I cried with you when your show was on with your son going to college. Like l told you once before I also had 3 sons. My middle son died 16 yrs ago and my heart is broken. My baby lives not so close so l don’t see him and my oldest son has his family and not as much time for me , but my husband was married and divorced 4G yrs ago to a Mexican girl who’s mother taught him to love authentic mexican food. So I learned from you and made tamales, tacos, avocado cremation sauce , enchiladas and a few other things from watching your shows and we are 67 yrs old but cook together from your shows and books . I wish you had dvd’s of your shows so we could watch and pause. I saved a few dollars of my social security money to buy your dvd’s if you make them. Thank you for your beautiful shows. Please send your octopus recipe. God bless you and your family. Thank you for your message Francine! That recipe was from Restaurant Pigua in Campeche, so I don’t have the recipe. Tried your Fish in Green Sauce from La Piqua. My first attempt at any of your recipes after watching your show a few times. I eat a lot of fish and am always looking for new ways to prepare it. Sauce was pretty easy and was delicious. Next your To Die For Ceviche. Thank you Ed! Hope you love the ceviche.